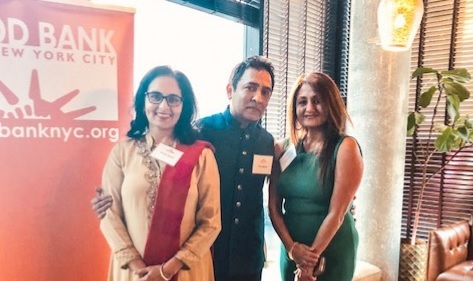 Food Bank for New York’s Indian American Council Founders and Advisors Aradhana “Anna” Asava and Raj Asava, and Co-Chair Payal Sharma at the inaugural event on March 12. The Food Bank for New York City forms new Indian American Council. In a new and encouraging initiative Indian Americans across New York are coming together to fight food insecurity with Food Bank For New York City, a major hunger-relief organization working to end hunger throughout the five boroughs. The Council’s Co-Chair is Payal Sharma, the Managing Partner of Baar Baar restaurant, and its Founders and Advisors are Raj Asava and Aradhana “Anna” Asava. The council will raise awareness, improve engagement, and channel resources and contributions of the Indian American community in New York City to support Food Bank’s mission. “In the spirit of ‘give where you live,’ the Indian American community – through IAC – has enabled close to 5 million meals in Texas in just over a year,” said Raj Asava, in a press release. “We are excited to bring this model to New York City and are confident that the Indian community here will galvanize around Food Bank and provide millions of meals for NYC’s food insecure children, seniors, veterans and vulnerable families,” added Anna Asava. The Food Bank for New York was founded more than three decades ago. Originally launched in North Texas, the Co-founders have since expanded the Indian American Council to Houston, as well.